LEBANON, Tenn. (AP) — In a story Dec. 18 about an EPA water regulation rollback, The Associated Press erroneously attributed a quote to Environmental Protection Agency acting administrator Andrew Wheeler. It should have been attributed to American Farm Bureau Federation President Zippy Duvall. LEBANON, Tenn. (AP) — The Trump administration on Tuesday called on farmers to throw their support behind a proposal to withdraw federal protections for many of the country’s waterways and wetlands. 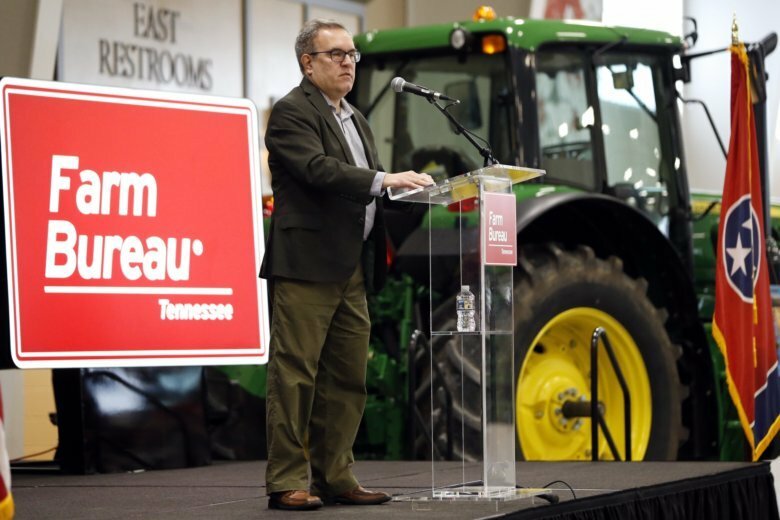 Environmental Protection Agency acting administrator Andrew Wheeler and U.S. Agriculture Secretary Sonny Purdue on Tuesday traveled to middle Tennessee to drum up support among the state’s agricultural community in their pursuit to replace the Obama-era water protections. Environmental groups have warned the proposed overhaul will be a grave assault on the aims of the 1972 Clean Water Act, the foundational U.S. water protection law. The event was hosted by the Tennessee Farm Bureau, where Tennessee Gov.-elect Bill Lee, U.S. Sen.-elect Marsha Blackburn and U.S. Rep.-elect John Rose — all Republicans — were in attendance among other top agricultural representatives who praised the regulatory rollback of the so-called Waters of the United States rule. The EPA first announced the change last week. Wheeler stressed he anticipates the new EPA’s plan will likely draw more than a million responses once it is up for public review in January. He said the EPA received more than 900,000 submissions during the last major effort to repeal the federal water protections — largely from advocates opposing the change. To counter potential negative feedback from environmental groups, Wheeler urged farmers to make sure their voices are heard. “The EPA has done its job, now all of us in this room have to help to get this over the finish line,” said Zippy Duvall, president of the American Farm Bureau Federation. The changes would affect what waterways and wetlands fall under jurisdiction of the EPA and the U.S. Army Corps of Engineers. The Trump administration would remove federal protections for wetlands nationally unless they are connected to another federally protected waterway. Groundwater, stormwater, most farm ditches, wastewater treatment systems and land already converted for crops would also no longer be regulated under the Clean Water Act. The Clean Water Act bans polluting any “water of the United States” without a permit. However, pinning down a definition of such water has been the subject of legal scrutiny for decades. Others counter the protections are an obstacle to farmers and businesspeople — adding that the current state of regulations has caused confusion for land owners, particularly when it came to permit requirements for protecting those federally protected waterways. “We believe that farmers are rule followers … when you begin with that premise, it’s very unsettling to be on our own land doing what you’ve done for years and then having a federal regulator give you a summons,” Perdue said. Obama’s administration implemented the rule in 2015, where it asserted that the federal government had oversight of a large range of ditches, lakes, and other bodies of smaller streams and tributaries that fed into waterways protected by the Clean Water Act.